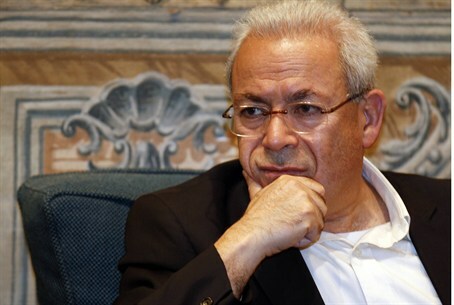 Syrian opposition leader Burhan Ghalioun announced Thursday that he is resigning from his post just two days after being re-elected by a vote of 21-19. “I will not allow myself to be the candidate of division, I am not attached to a position, so I announce that I will step down after a new candidate has been chosen, either by consensus or through new elections," he said in a statement. Ghalioun, who has led the dissident Syrian National Council by consensus since its founding in October 2011, was re-elected as the main opposition bloc's chairman in a vote held in Rome on Tuesday. He said he would remain a member of the SNC, “hand-in-hand with the young people who struggle, the young people of the revolution of dignity and freedom, until victory." Ghalioun’s announcement came shortly after the Local Coordination Committees, a network of activists on the ground in Syria, threatened to pull out of the SNC over its “monopolization” of power. The SNC was particularly criticized for not sufficiently coordinating with activists inside the country, and for the strong influence wielded by representatives of Syria’s Muslim Brotherhood. Ghalioun’s re-election in Tuesday’s leadership contest was also criticized by activists for "being decided by the Brotherhood." It came despite SNC rules that require the chairman’s rotation every three months. Left-leaning and Arab nationalist in his thinking, Ghalioun was deemed capable of representing a coalition composed of multiple tendencies, including Islamists, nationalists, liberals and independents. While most opposition forces agreed in March, after laborious negotiations, that the SNC would be the “formal representative” of the Syrian people, it has little actual control over events on the ground. Of particular note is the inability of the SNC to exercise authority over the rebel Syria Free Army, commanded by dissident Syrian officers who have sought refuge in neighboring Turkey. The SFA, itself poorly organized and equipped, consists of over 20,000 lightly armed defectors from the Syrian armed forces who have focused on a strategic of deadly hit-and-run raids and ambushes targeting forces loyal to Syrian president Bashar al-Assad. Recently, the SNC backed a UN-brokered peace-plan that included a ceasefire to begin in April, but could not convince SFA forces to commit to the plan. SFA commanders tentatively accepted the ceasefire insofar as it was mutual, but it has not been observed by either side. Meanwhile, Assad's embattled regime retains a fiercely loyal core of Alawite officers and security officials who control the Army and pervasive secret police agencies that rule the country. US officials have said, without an external intervention to dislodge him, Assad is likely to remain in power. Ghalioun's resignation underscores the disarray Syria's opposition finds itself in even after 14-months of bloody unrest and an estimated 12,000 plus deaths in the country. It is unclear if a candidate capable of uniting Syria's divided opposition exists.